The TakeAway: The new Green Production Guide and longstanding Environmental Media Association help Hollywood pursue sustainability. At last night’s Emmys, George Clooney received the Bob Hope Humanitarian Award for charitable work on behalf of disaster and terrorist victims—including those affected by tragic events in Haiti, Darfur, the Gulf Coast, and 9/11. In his acceptance speech, Clooney said that while everyone wants to help in the immediate aftermath of a disaster, the really hard part comes months later, when the story subsides but the experience lives on. “Here’s hoping that some very bright person right here in the room or at home watching can help find a way to keep the spotlight burning on these heartbreaking situations that continue to be heartbreaking long after the cameras go away,” he said. Clooney hit the nail on the head, calling out the Hollywood do-good syndrome of supporting social and environmental causes when they make good press, then dropping them when they fall out of vogue. Hollywood’s star-power can play a key role in popularizing the shift to sustainability, but only with sustained interest. A new initiative may help achieve this goal, and build upon the efforts of another that’s been active for 20 years. On August 11th, the Producers Guild of America Foundation and PGAGreen.org launched the Green Production Guide to help film, television, and new media professionals find resources and partners to help build sustainable practices into their work. With guidance from the newly-formed Green Production Alliance, the Guide’s interactive website (which is still in Beta mode) includes a searchable database of 1,500 experienced vendors, with information about green products and services; vendors must submit references verifying their work to get listed. Also included: best sustainability practices in production office energy usage; set lighting; set design and construction; camera and sound; catering and craft services; hair, makeup, and wardrobe; and the use of carbon offsets. An interactive “Carbon Calculator” helps productions gauge their carbon emissions, based on items such as electricity and heating, fuel, flight, and hotel use. Launched with seed funding support from Disney, NBC Universal, 20th Century Fox, Sony Pictures, and Warner Bros., the Green Production Guide invites producers and companies to submit stories about their positive experiences in applying sustainability practices. Similarly, the Green Production Alliance intends to sponsor forums for sharing environmental ideas and information, developing voluntary common-use tools, and providing education and training opportunities. “I strongly believe that sustainability needs to be part of our everyday vernacular, and I’m extremely proud that the industry has successfully collaborated to launch the Green Production Guide,” said PGA president emeritus Marshall Herskovitz, producer of Thirtysomething, My So Called Life, and Blood Diamond. A similar initiative, the Environmental Media Association (EMA), has long mobilized the entertainment industry to educate and inspire people to action regarding environmental issues. Founded in 1989 by Cindy and Alan Horn and Lyn and Norman Lear and directed by Debbie Levin, EMA hosts the annual EMA Awards, which celebrate the entertainment industry’s environmental efforts in various categories. (This year’s 20th Annual EMA Awards will be held on October 16th.) 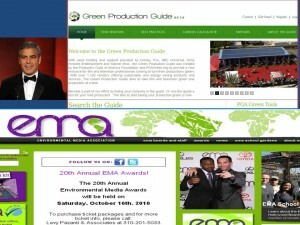 The EMA Green Seal honors television and film productions that “go green”. You can download EMA’s quarterly Greenlight Newsletter at EMA’s website. We hope to see more sustainability themes in upcoming TV shows and films, based on green production standards. Entertainment has the power to influence our public values, oftentimes more so than new laws, rules, and regulations. So congratulations to George Clooney, and all the others Hollywood doers who use their power wisely. This entry was posted in Corporate Sustainability, Media & Entertainment. Bookmark the permalink.